Bob Seeley (USA) is recognized as one of the worlds most celebrated and accomplished boogie-woogie pianists. He started playing piano in Detroit at age 13, mostly classical, until he got hold of some boogie-woogie piano arrangements. Since then, Seeley, who just turned 90, has recorded and released five solo albums, made stopovers at Carnegie Hall, at venues across Europe, and at clubs around the country. His landmark birthday will be celebrated big time at The Ark, where the audience gets to sign a super-sized birthday card to let him know how valued he is in the music world. Luca Filastro (ITALY), who is a young and very talented Italian pianist and composer (not yet 28 years old), began playing piano when he was five years old, having heard family recordings of Fats Waller, Jelly Roll Morton, and others. He also has a classical background, but is now known for his sincere love of the great tradition of American jazz and for his incredible sense of swing, blues, and improvisation. Filastro performs in jazz clubs around the world. Philippe LeJeune (FRANCE) was a classical pianist at the time he attended a 1968 concert in Reims, France, where he heard master boogie-woogie and blues pianist Memphis Slim. He immediately put an end to his classical career and began teaching himself the blues, scouring record shops for LPs by boogie-woogie greats. LeJeune has released six CD’s in the United States and makes appearances in American and European jazz and blues clubs and festivals. 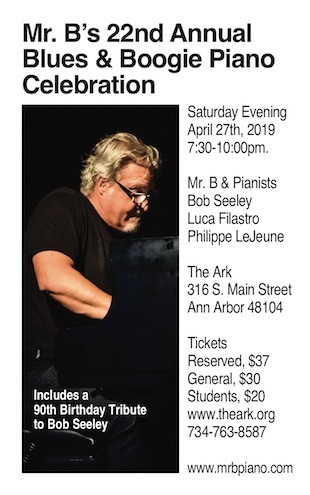 Tickets for The Ark’s 7:30pm concert (note the 7:30pm start time) are $37 for reserved seating, $30 for general admission, and $20 for students, general admission, and are available at The Ark box office, 316 S. Main Street, Ann Arbor, MI 48104, by phone at 734-763-8587, or online at www.theark.org. Drummer Julian VanSlyke will join the group at The Ark and DIA performances.